I consciously endeavor to have an uncomplicated life. My world is designated as a drama-free zone. That is not to say that bad things don’t happen. That part of life (cat surgeries, layoffs, sprained ankles) cannot be controlled. Drama can. I favor minimalism when it comes to home decor. My only fault being I have a few too many books, although with my e-reader I am not buying new ones very often, I still like the feel of a real book and can’t bring myself to donate them all away. I favor simplicity when it comes to my beauty routine. If it takes more than five minutes to do my make-up, to do my hair, or to get dressed, I am not doing it. I wear a black dress nearly every day, adding variety with a scarf. Yes, I love food. The exploration of it. The obsession with it. The never-ending desire to enjoy it and discuss it. But I like uncomplicated food. The range of uncomplicated is endless. Uncomplicated can be very, very simple. Uncomplicated can also strangely (in my opinion) be complex. The simple (yet complex) meals delivered by Blaine Wetzel at The Willows Inn on Lummi Island are the ultimate incarnation of this. 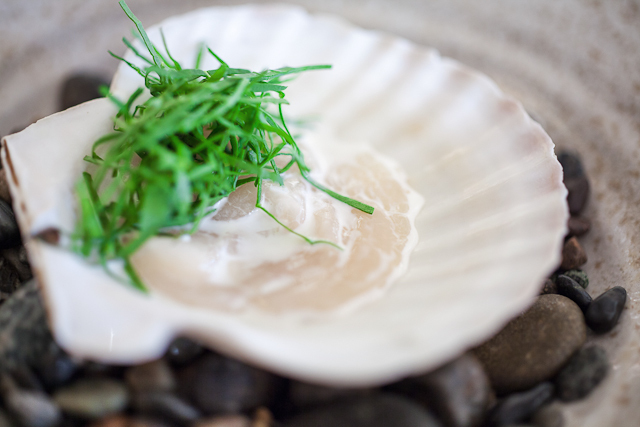 This is a simple Fanny Bay scallop with cream and arugula, nothing complicated about it, but oh is it simply exceptional! So what does this have to do with yoghurt? Would you believe that yoghurt was my gateway food into my current food philosophy? When I asked, “what is this?” My now-hubby, explained very matter-of-factly, “the dessert of the Gods.” He said when it comes to desserts the Greeks are the smartest people in the world. 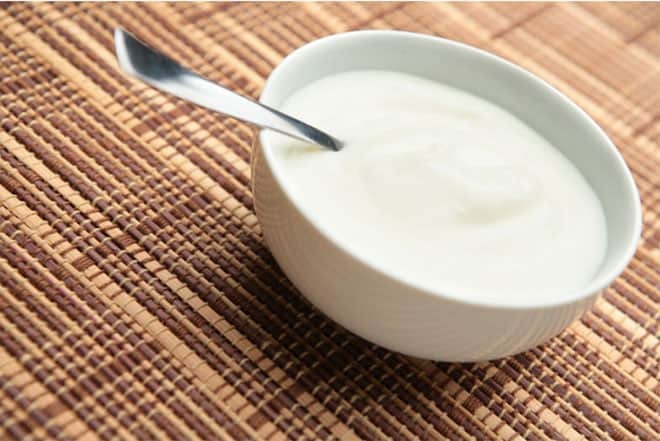 Plain yoghurt with a little bit of honey not only satisfies the desire for something sweet at the end of a meal, but also helps with digestion (since it has although good cultures in there). My view on yoghurt changed forever. See for the longest time, and during the time I grew up, Americans have been exposed to really crappy yoghurt. Sugary, chemically enhanced products that shouldn’t even be labeled yoghurt. When I moved to Europe, my yoghurt world was expanded by a million! There is nothing like the taste or European Old World style yoghurt and for three years I enjoyed it in France, in Switzerland, in many countries. When we moved back to the San Francisco Bay Area, I lamented on what the heck we were going to do for dessert. We eat yoghurt every single night for dessert. Even if we go to a restaurant for dinner, we will have yoghurt, either with fruit or with honey, when we get home. I was lucky to live in a food-centric region in which many of the grocery stores carried “European-style” yoghurt, including [thankfully] Mountain High Yoghurt. 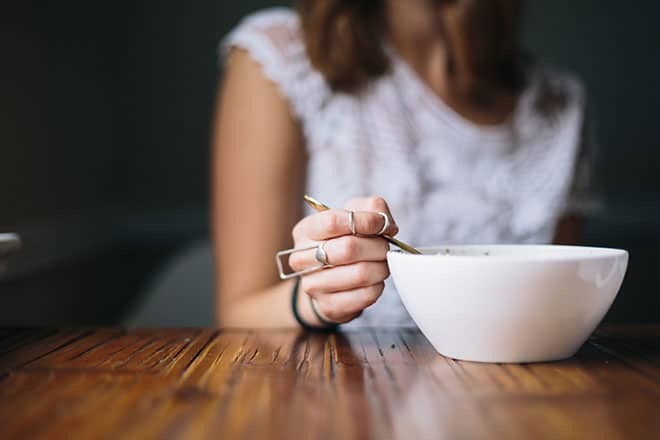 Now, as the years have progressed what was once viewed as specialty yoghurt is now considered mainstream and it is available nearly everywhere! – I use it as a sour cream substitute whenever I make Mexican food. I add it to tacos, burritos and fajitas. – I spoon it into soups or chilis. Mr. Misadventures makes big pots of soup on Sunday, which we eat for several days during the week. Adding in a spoonful of Mountain High Yoghurt on the second or third night makes it like a whole new soup. – I am not a big fan of mayo, so when I am making tuna or egg salad at home, I use yoghurt instead. I am grateful to that first meal my husband cooked for me and the introduction of yoghurt for dessert. I am grateful for the years I spent in Europe getting a real taste for Old World style yoghurt. I am grateful to Mountain High Yoghurt for making such a delicious American yoghurt. And I am grateful for the simple yoghurt taste and simple ingredients. Life is already complicated enough, your yoghurt should be one of them! How about you? Is yoghurt part of your eating life? Have you tried Mountain High Yoghurt? Do you have a unique way of using it? If you haven’t tried it before, now is your chance! Visit Mountain High Yoghurt where you will be able to download a coupon for $1.00 when you buy 2 tubs after subscribing to the Mountain High Yoghurt monthly newsletter. The newsletter is chock full of news, recipes, coupons and craft projects (the tubs can be turned into amazing things!) but you can also find much of the same on their Pinterest boards, their Facebook page, and I love the photos on their Instragram feed – check them all out! I love hearing about this being the dessert of the Gods! It makes sense. Now I want to find ways to incorporate more yoghurt into our family diet. @Joann, dessert! Make it sweet and add fruit, you won’t feel cheated. It was traveling to Greece that totally changed my view of yoghurt as well. Simple is best! Have never tried it with figs, but that sounds delicious! @Laura, I had Greek yoghurt and honey for dessert in Cyprus (as close as I have been to Greece) and it was heavenly! I eat plain, whole milk yogurt with granola almost every morning for breakfast. Now, of course, you have me intrigued by the “European” style. I will keep an eye out for this brand! @Katie, it is thicker and creamier. You have to try it for dessert too with honey, it is amazing for digestion. I love yogurt for breakfast, but I never thought about having it for dessert. It totally makes sense! I need to try it try it one of these days! We don’t usually have dessert, but this is a guilt-free way to do it. @Megan, absolutely and it is fantastic for digestion. I haven’t heard of Mountain High Yogurt but I have been enjoying greek yogurt lately. I have not tried European style yogurt before (except our version of Greek yogurt), but I am looking forward to trying the Icelandic version in a few weeks! @Tamara, can’t wait to hear back how you like it! That is the exact yogurt that I buy! (I can never remember to spell it the same as they do!) I use it in my smoothies! I eat vanilla yogurt with granola and blueberries almost every morning. I have never heard of this brand, but I will keep an eye out for it. @Robin, great breakfast, give you lots of energy for the day! I am not fond of yogurt but my daughter loves it. I will umpo it up a little bit with flavor next time with your version. @Chukskulit, definitely try out different kinds, you might find one you really like, it is so healthy for you! I love your story on the yogurt & how it changed your view! It really is an awesome food. @Stephanie, I love it for digestion, I tend to over indulge a lot! I do the same thing now that I’ve found Greek Yogurt. I use it on everything, in all sorts of recipes, and with just a little bit of honey. @Kierstan, have you used it in baking? That is the one thing I haven’t tried. 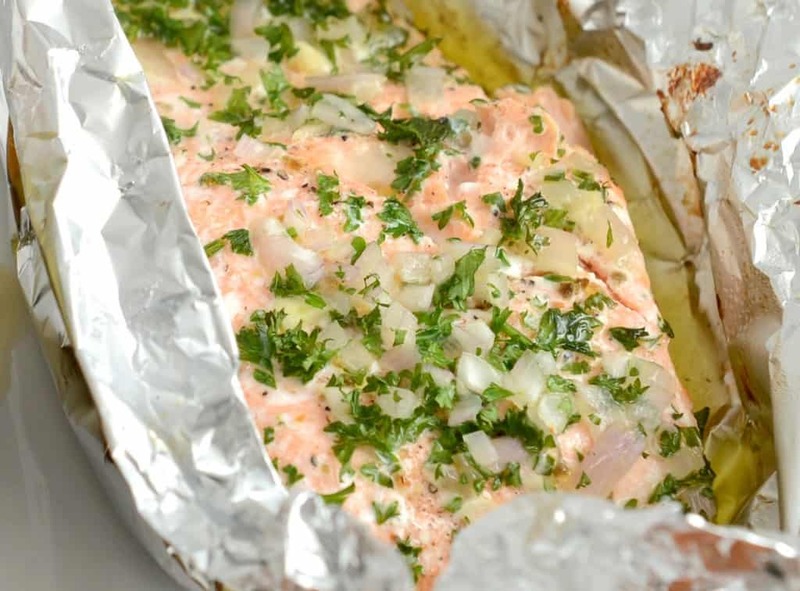 I’ve used it in baking, all kinds of cooking, instead of sour cream, or instead of mayonnaise! It’s so multi-use. Love the Yogurt story. In my (Burgundy) family, people eat it (still as a dessert) with salt and pepper and it was a challenge to be allowed to put sugar on it. As for the figs…. I would go for the “confites” . @Dominique, I have never tried it with salt and pepper, I think I would LOVE that, I must try it! Merci! I am also not a big fan of mayo and use Greek yogurt as a substitute. That egg salad looks delicious! @Jessica, I have never tried crab salad or crab cakes (I am thinking of you being in the DC area) I wonder if that would be good with yoghurt? Omigod … the FIGS! Figs and yogurt and honey are just pure heaven. I agree with you about how hard it is to find good chemical/sugar-free yogurt, especially in the US. And I LOVE how in Europe they have yogurt in little glass jars. I’m going to have to try and find Mountain High Yogurt. Sounds delish. @Rachelle, the glass jars are the best! @Britany, true it with brown sugar or syrup too – my hubby likes it that way too, I stick with honey! I love all the uses!! Yum! My favorite is as a replacement for sour cream in Mexican food. I had never heard of Mountain High before, will definitely check it out. Now I need to go eat some figs and honey! @Katie, I use it all the time, it it thick and creamy a perfect substitute for mayo, I like sour cream, but I don’t have it in the fridge very often so I use yoghurt. 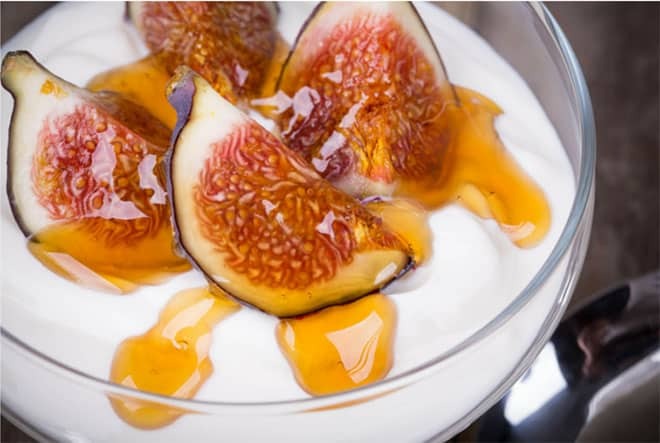 Gosh, those figs look amazing on top of that yoghurt! And I completely agree that I love living life drama free. 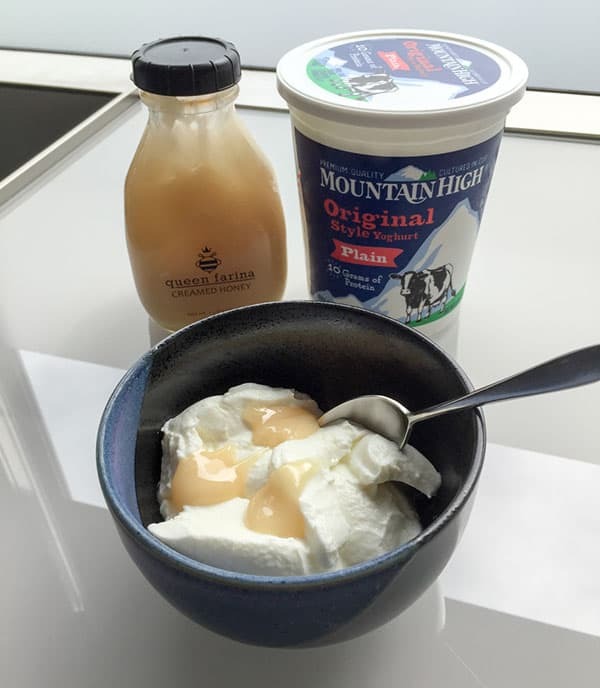 I am a pretty simple person so I love this mountain high yoghurt! @Ashley, it is good stuff! I would never have thought to use yogurt for egg salad – but what a great idea! Thank you! @Jaclyn, try it out, it is healthier than mayo. I use yogurt as much as I can in cooking and baking, in lieu of sour cream, etc. I’ve never used Mountain High, but am going to check it out! @Alida, do try it out, it is super thick and creamy. How do you use it for baking? Sometimes the simplest things are the most delicious. I love yogurt with just a drizzle of honey. It’s the perfect treat. Adding figs is brilliant! We have a fig tree and when they ripen come September, I am always looking for something to do with them. @Jennifer, my hubby introduced figs to me, I don’t like them all the time I think they are too sweet, but the tartness of the yoghurt is perfect for balancing that. @Carrie, its the best. I also just used it as a raita replacement when I ordered Indian food that was a little too spicy! A scoop of yoghurt calmed the fire in my mouth! I completely agree about the bad, sugary yogurts that most Americans find normal. The type of yogurt and way you use it is right up my alley. @Jenna, I am so glad the yoghurt culture as evolved! We always have a container of Mountain High in our fridge. I love how versatile it is!! @Deborah, I love its thickness, it kinds of seems like I am eating ice cream! i like either extremes.. really flavorful or really simple. i love how japan masters the art of simplicity in pretty much everything including food. @Esther, I agree, which is why I love Japanese food as well! I honestly have not had yoghurt in years, i bet since college. I am going to try it again. I bet a little honey, chia seeds etc, could make it fun and almost dessert-like. I have not heard of this brand. 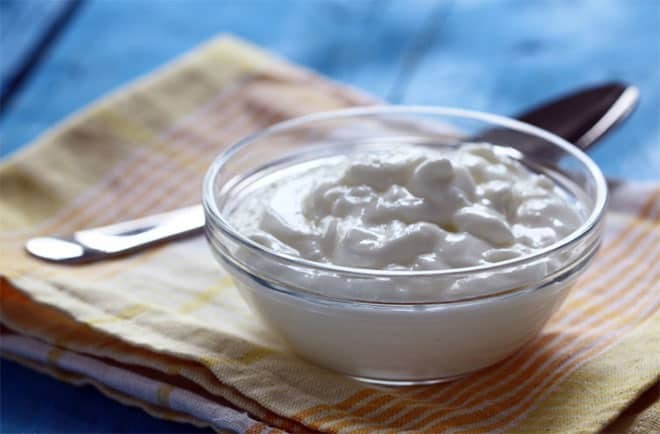 I do use yogurt all of time, from dips, spreads, mixed with granola and fruit, in place of sour cream….It is great! I will have to do some searching and see if I can find this locally to me! !You’ve made me really want to try what Ive been missing!! i have never tried this yogurt before but it looks good! I like yogurt that is sweet or has fruit in it. I will not have bitter, or salty yogurt (or any bitter or salty dairy product in general). @Olivine, I was the same way until living in Europe where I got a taste for it.